First off, I would like to thank DeftDigits.com for this great blogging opportunity. Let’s immediately jump in: scales, what are they and which one should you learn? This short article will spend more time on the latter than on the former. 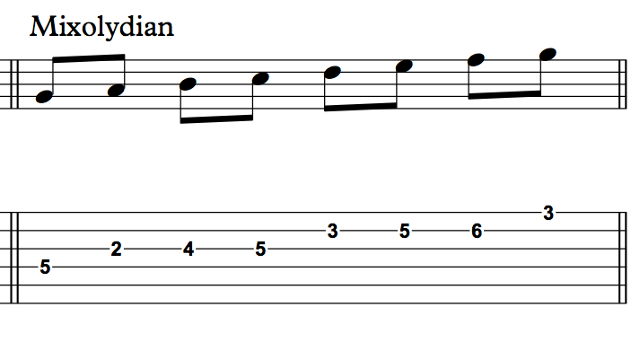 Now, here’s a good list of the first six scales every guitarist should spend some time honing. As mentioned above, any scale can be used to improvise or write new music AND they’re also great to know from the music theory side of things. If you know your scales well, this will lead to a greater understanding of harmony, and how chords move to one another. Talk about a great way to effectively master songwriting and accompaniment! Thus, learning and practicing scales doesn’t have to be dry or boring. Some of you will be completely new to scales and modes, a quick work of advice: don’t let the word MODE intimidate you. A mode is still just another scale. We use the term mode to imply that we’re playing a scale starting on a different note, we’re just reordering! For example, 1-2-3-4-5-6-7 becomes 3-4-5-6-7-1-2. Same 7 pitches, just ordered differently. 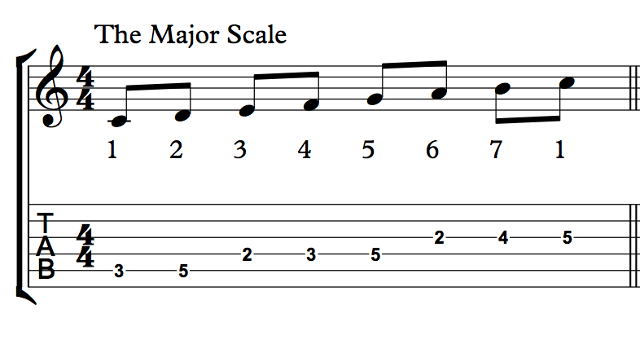 This scale is the cornerstone of virtually all so-called tonal music, and will be our foundation for many of the other scales we’ll explore in this article. It is THE most important scale to learn, period. The major scale gets divided into its modes (e.g. the modes of the major scale) simply by playing the same seven notes, but starting on another note. We do this until we have started on all of the 7 notes and climbed up. We can also say starting on another scale degree. Notice here how the C major scale is also referred to by its modal name C Ionian. Don’t worry, C major = C Ionian = C D E F G A B. No surprise there! Notice that from just the major scale, we’ve already extracted 7 distinct “musical universes”. Play them and listen! Without going into too many details about harmony, modes can really add variety to your soloing because each mode depicts a different “emotion” so to speak. You should spend time practicing each mode above with a drone over the root note (I like to use an open string whenever possible). This way, you get a clearer idea of what feelings the mode bring up in you. 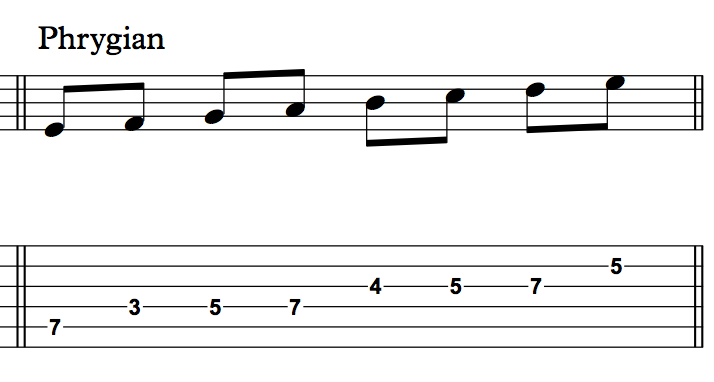 Pentatonics are super useful and, quite frankly, most guitarists start their improvisation journey right there: good ol’ blues in A, with a pentatonic “box” at the 5th fret. Don’t let the simplicity of this musical device fool you: it’s very rich and open-sounding! Oh, and yeah: penta means five. So pentatonic scales always contain only five notes. 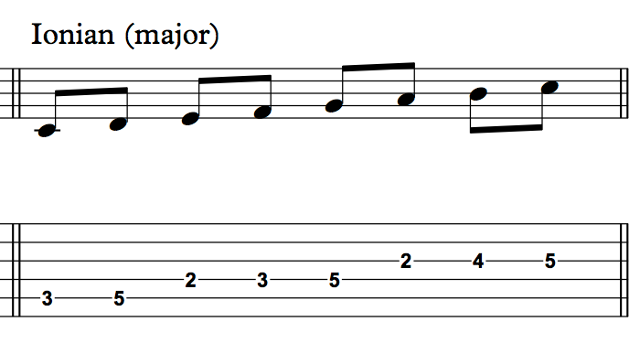 The best advice I have for beginning and intermediate guitarists is to start digging into the lesser known pentatonic: the major pentatonic. 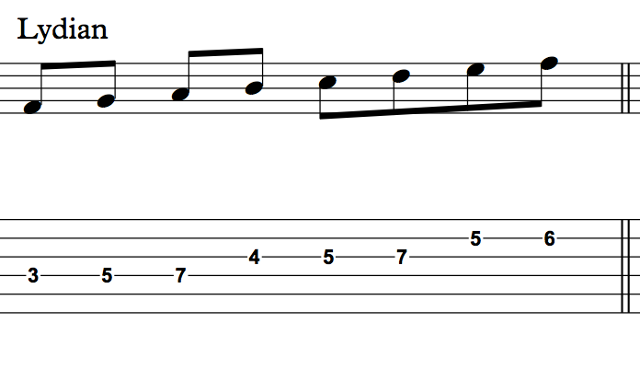 Quick pro tip: if you’re soloing on blues in A, instead of using that same pentatonic box at the fifth fret (A minor pentatonic) start improvising three frets down with the exact same scale shape (F# minor pentatonic). The result? You’ll actually be playing into A major pentatonic … and jazzier and more blues-friendly device than the major scale itself. Think three frets, and you’re set. 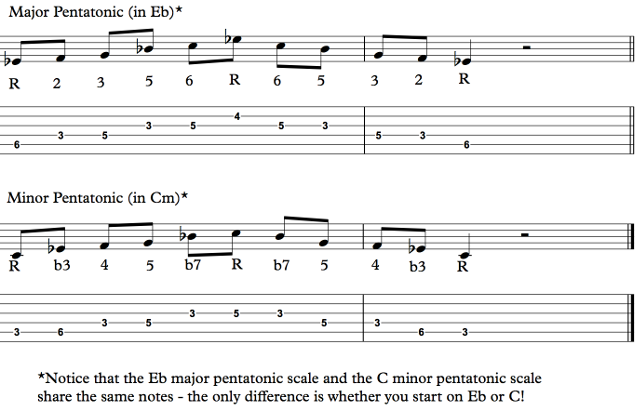 The example in the picture shows you how the Eb major pentatonic and C minor pentatonic contain exactly the same five notes. 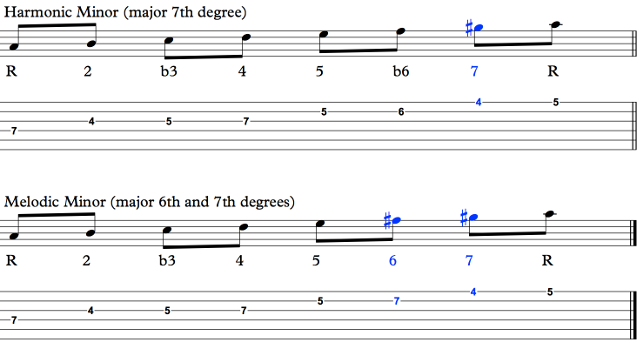 If you’re a theory buff, you can also “reach” the major pentatonic scale by starting with the actual major scale and removing the 4th and 7th degrees. Notice how both the major and minor pentatonics have a blue note (not in the picture), that appears in the same spot relatively. In the case of Eb major and C minor pentatonics, the “blue note” is the F# or Gb, found right in between F and G. Use this to add color, chromaticism and feeling to your solo licks. Few guitarists realize that there are in actually three good-sounding minor scales … and we’re not talking about modes this time. We’ll, we kinda are … let’s see: what we refer to as the natural minor scale is actually the Aeolian mode. Meaning that if you want to play A natural minor, simply play A Aeolian mode. Or in other words, play the C major scale starting on its 6th degree, the A note. Now this is all well and good, but musically, things would be a little dull without the intervention of what we refer to as the harmonic minor scale. It is exactly the same as natural minor (or Aeolian) except for one note: the 7th degree. Raise the 7th note of the A natural minor scale to a G# in order to get the A harmonic minor scale. 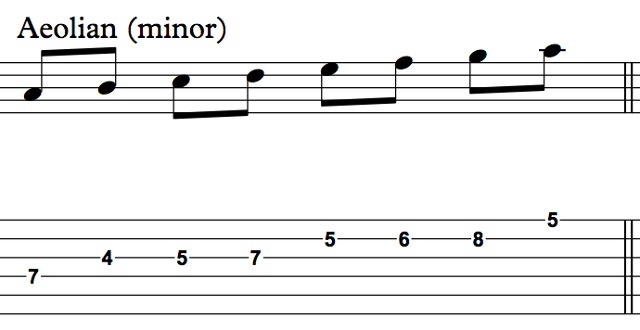 The harmonic minor scale has its modes and lush harmonic implications. The nomenclature is right: the harmonic minor scale really generates beautiful harmonies. But that’s also a story for another post! Few people realize that melodic minor is used extensively in jazz, even on tunes that are not in a minor key. 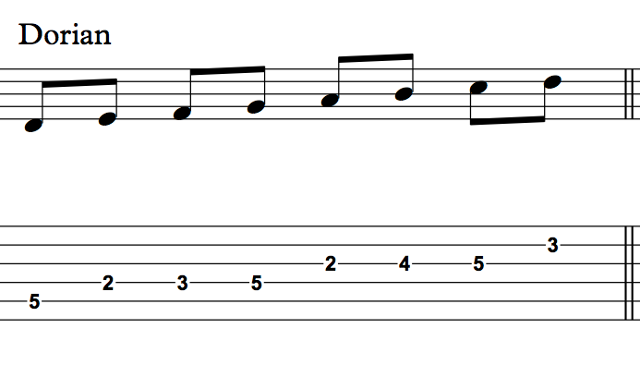 The modes of the melodic minor scale generate interesting altered dominant chords and such. Still more stuff to discuss in another article! Sorry guys. Pro tip: the A melodic minor scale in the picture is actually only one note away from the A major scale. The steps are easy, take the A major scale: A B C# D E F# G#. Then simply lower the 3rd degree down by a half-step. This means that the C# becomes C natural. And bingo, you got the A melodic minor scale: A B C D E F# G#. It’s easier that having to first think A Aeolian and change two notes, in my humble opinion.